Back in the early 90s, when I was in my mid-20s, I bought a lot of magazines. A lot of magazines. Quite a few I still have. Others, like the Asimov's and Analog's I bought through the 80s, have largely gone, apart from a few favoured issues. Also remaining is my collection of the first eighty or so issues of Interzone. Those formed such a fundamental part of my reading experience I don't see myself ever letting go of them. But I also bought publications rarely if ever remembered now. To a great extent, these magazines, and others, were superseded by the internet. 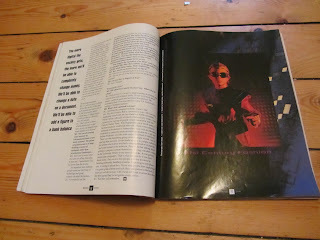 At that time, in the early 90s, technology had progressed to the point where it was possible to do relatively cheap, fast but professional-looking graphics and typographical layout on a computer, opening the gates to a veritable revolution in budget magazine design. It allowed any number of publications that were previously simply typed up and photocopied to gain a professional sheen, regardless of how small the print run or how cheaply produced. I got on the bandwagon myself, working on various minuscule titles as editor, publisher, contributor and designer, all at once and in all kinds of combinations. That led me to do a course in graphic design. That led in turn to me getting freelance work on a local music publication. That led in turn to working in a printshop, in a desperate attempt to escape the slave-fiefdom Borders Books I had been trapped in for a year and a half. Amongst those magazines I still have are sf magazines like Extro, which appeared at the same time as Interzone, and lasted three issues. Purportedly, a major distributor binned an entire run of the magazine in order to make room for some other publication, and there was apparently little they could do about it. One of those issues contains the first published short story by Ian McDonald. There were others, infinitely less interesting, like Nexus and ProtoStellar, which lasted either one or two issues. Much more worthy, in my opinion, are my collections of US publications like New Pathways, Aboriginal SF, SF Age and others, which respectively lasted dozens of issues. Also amongst that collection are the likes of SF Eye, Omni and Mondo 2000, each of which have had the term 'cutting edge' applied to them at various times. I've started selling many of these magazines off, but pulling them out and photographing them in order to put them on Ebay does give me an opportunity to revisit them. I even have print issues of Boing Boing before it uploaded itself. 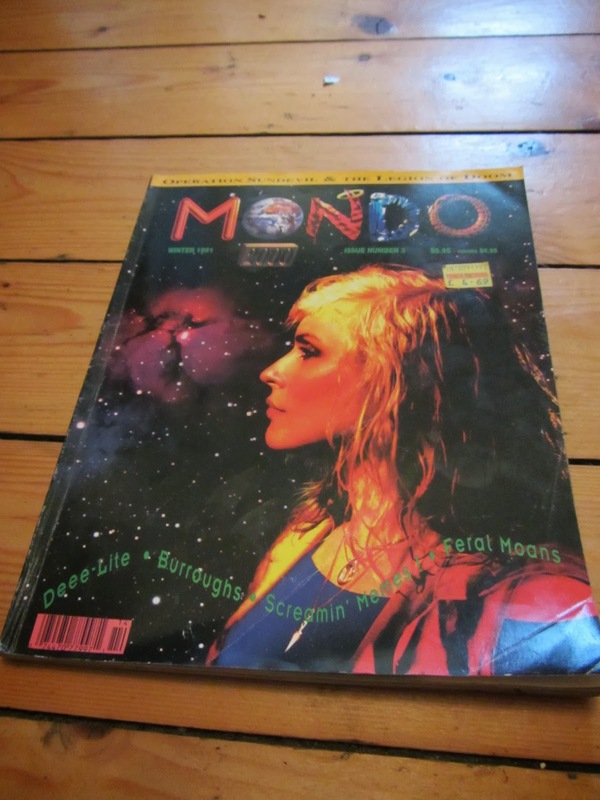 Mondo 2000 in particular is interesting because much of what was in this distinctly non-mainstream magazine in the early 90s is now very much the mainstream. For instance: there's a 1991 issue featuring Debbie Harry on the cover. 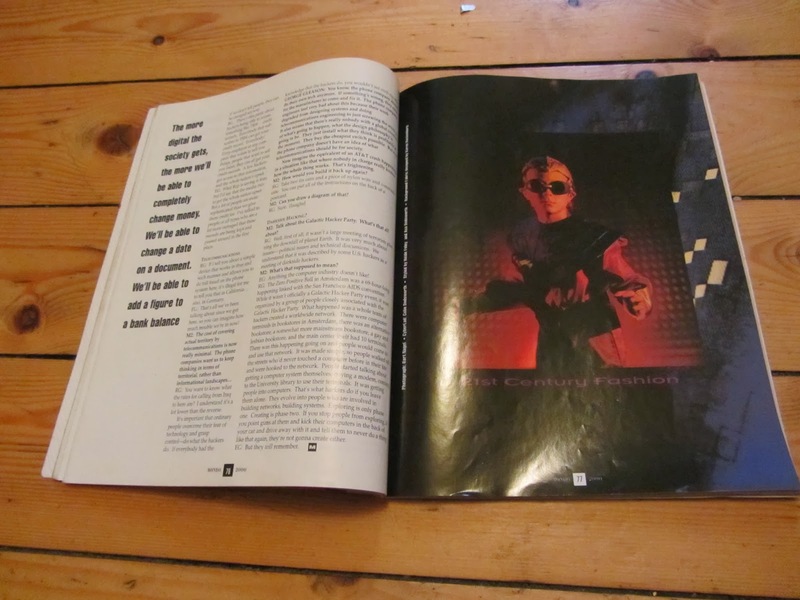 A lot of the articles inside focus on hacking, government intervention, phreaking, and a whole variety of related stuff like members of the Legion of Doom, Virtual Reality 'street tech' (in 1991?! ), 'computer graphics (read 'swirly fractals'), and fashion articles with dresses covered in prints of Aleister Crowley. Not to mention editorials and articles by Robert Anton Wilson and William Burroughs. A veritable cornucopia, you might say, of early 90s counterculturalism bashing head-on into retrospectively primitive computer technology. At the time, I couldn't get enough of stuff like this. Even so, I did recently see an image from an issue of the magazine of a 'cyberpunk' loaded down under a mountain of gear, all of it carrying out a whole range of functions nowadays available squeezed into a handheld smartphone. (It just occurred to me someone should take William Gibson's 'Neuromancer' and replace all of the imagined technology with the real, modern variety. I suspect it might not be that hard to pull off). Anyway, all of these magazines are gradually getting sold off. Some are rare enough I'm making more off selling them than they cost me in the first place, and they weren't exactly cheap even back then. They have to go, partly because it seems a shame to lock them into a cupboard for the years I'll be back in Taiwan, and partly because a part of me wants to reduce the mountain of stuff that's accumulated around me over the years. And to be honest, in some cases, it's not actually that hard to find scanned PDF's of these publications floating around online...and if I ever do re-read them, then, it's more likely to be on the screen of a tablet than a physical artefact held in my hands.